fancy stitch or a color pattern is simplified. for the top of the foot and front of the leg. The turning of the heel is easier. and the leg is solved. or tension like other patterns. You work from a "footprint"
of the foot to shape the sock. 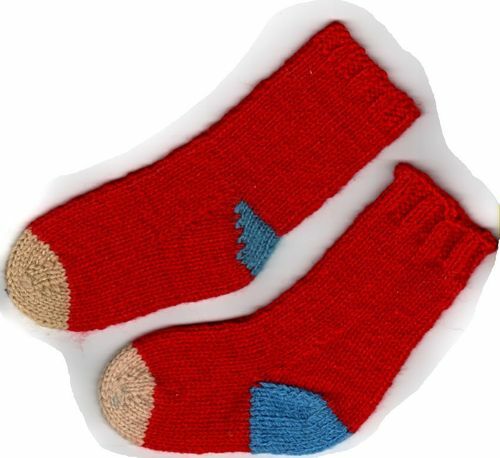 shoe sizes from Baby's 0 to Mens 15.
used to knit the socks to fit their feet. You have a choice of heels for the socks. The instructions also include an easy cast on and a stretchy sewn half-hitch cast off. Novice and experienced knitters have tested this pattern with great success. If you would like to use Paypal or your credit card, send me an email message. Begin your new adventure in sock knitting today.